From crippling drought in southern Africa to a record number of February tornadoes in the U.S. Southeast, an exceptionally strong El Niño has been making headlines around the globe as it tampers with the world’s weather. While the event has begun its slow decline, those wide-ranging impacts will continue to be felt for weeks and months to come — good news for those in California, who need El Niño-fueled rains, but bad news for the many areas, like Indonesia, which is suffering from deep drought, food and water shortages, and wildfires. Already this year, El Niño-related weather has cost billions of dollars in damage and left some 100 million people facing food and water shortages. Through the interactive graphic below, Climate Central takes a look at how this major climate pattern typically influences the world’s weather, what it can mean for societies in the areas it affects, and what has actually been happening with this particular event, which ranks amongst the strongest on record. After all, no two El Niños are the same. For instance, while Southern California was drenched during the 1997-1998 El Niño, it has remained disconcertingly dry this time around. First, the big picture: El Niño is most known for shifting a large pool of warm ocean waters from the western to the central and eastern tropical Pacific. That shift changes where heat is pumped into the tropical atmosphere, disrupting its typical circulation patterns. Those local disruptions cause a domino effect through the global atmosphere that can alter weather thousands of miles away. There are two main circulation patterns that are affected. All around the tropics is a pattern of rising and sinking air — like a vertical loop — called the Walker Circulation. The rising air corresponds to areas of unsettled, rainy weather, while the sinking air creates a stable, dry clime. Normally in the tropical Pacific, a major area of rising air is found over the western portions, where the warmest waters are found. With the eastward shift from El Niño, that rising air (and its sinking counterpart) move eastward as well. This displacement shifts the other branches of the Walker Circulation around the tropics, pushing wetter weather over areas that might normally be dry and vice versa. These areas typically see some of the strongest impacts from El Niño because they are in a region more directly linked to it. 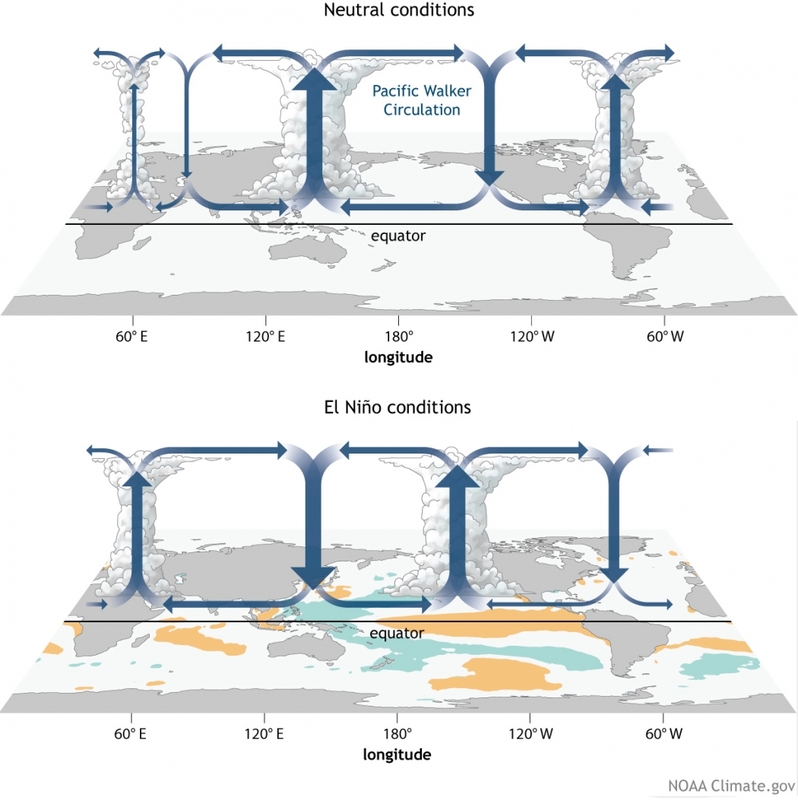 How the Walker Circulation changes from neutral to El Niño conditions. The changes in the Walker Circulation in turn cause shifts in another looping pattern called the Hadley Circulation that runs north-to-south to the Walker’s east-to-west. And those changes in the Hadley Circulation can affect the subtropical jet stream — an area of fast-moving air that guides storms — in both the Northern and Southern hemispheres. 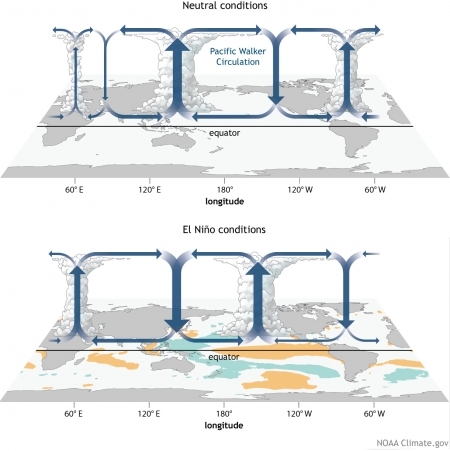 This is how El Niño can affect regions far from the tropics. The changes in these main circulation patterns interact with other factors, like seasonal monsoons and other major climate patterns, which is why none of the typical impacts associated with El Niño are guaranteed. It merely shifts the odds in their favor. Indonesia, and Southeast Asia more broadly, is one of the areas most directly impacted by El Niño. The eastward shift in the Walker Circulation means the normal area of rising air and rainy weather is shifted eastward as well, leaving the Indonesian area high and dry during much of the year. This can lead to drought that can cause water shortages and crop and livestock losses from dried up fields. Those losses then lead to food shortages and rising prices, and can also increase the odds of large wildfires. This year has seen major drought grip Indonesia, Vietnam, Thailand, the Philippines and much of the U.S. Pacific Island territories. In Indonesia there were major delays in the planting of the rice crop, leading to concerns over food shortages. And when farmers set their usual fires to clear brush for planting, the dry conditions caused many to burn out of control, causing one of the biggest burn years on record and leading to a pall of smoke over the region. In Vietnam, drought has led to salinization issues in the Mekong Delta region, home to some 20 million people and a major rice growing area. Drought has caused the Republic of the Marshall Islands and the Federated States of Micronesia to declare states of emergency, with some islands enacting water rationing and having to have water shipped in. That same eastward shift of storm activity tends to bring drier conditions to northern Australia during the Southern Hemisphere summer and more broadly to the east in the winter. It also tends to bring warmer summer weather to southeast Australia because of the larger mass of stable, subsiding air in place. During El Niño years, drought and wildfires also become a concern here. A wildfire burns along the Great Ocean Road in Victoria, Australia in December 2015. So far this year, Australia has seen a mixed bag of El Niño impacts. While dry conditions have been in place in much of the usual areas, some of the inland regions of the eastern part of the country actually had fairly normal rains. That may be due to exceptionally warm Indian Ocean waters providing more moisture to storm systems. The southeast has seen some major heat waves, though, with temperatures sometimes climbing above 100°F (40°C). 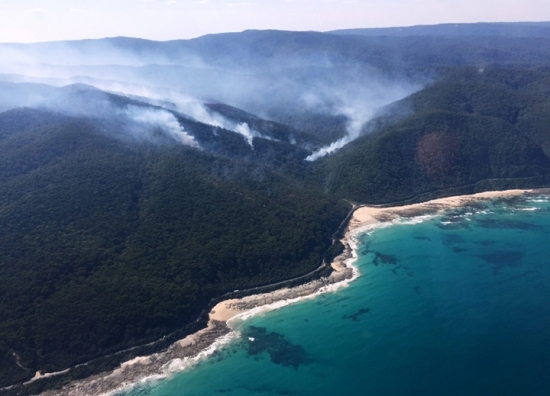 The hot and dry conditions have helped create more favorable wildfire conditions, with several burning in Victoria this year. One of the worst destroyed 116 houses around Christmas. India also tends to see drier weather during the Northern Hemisphere summer because the changes to atmospheric circulation patterns delay the onset of the seasonal monsoons. Monsoon rains are critical to supplying water for drinking and agriculture, and El Niño years tend to see drought develop in parts of India. This summer, rainfall in India was 14 percent below normal and reservoirs were down by 30 percent, according to a United Nations report. That led to shortages of drinking water in some areas and caused rice, corn and soybean fields to dry up, setting off worries for food shortages and inflated food prices. El Niño can lead to wetter weather in southern India, which also happened this year, with torrential rains that caused major flooding in the area around Chennai. Moving back out into the Pacific Ocean, the warmer ocean waters can cause bleaching of coral reefs, killing them. This event has seen one of the longest global bleaching events ever recorded, according to experts. Warmer ocean waters in that area also provide more fuel for hurricanes in the central and eastern Pacific Ocean basins. The atmospheric changes El Niño brings also mean more favorable winds for storm formation. This year saw above-normal hurricane activity in the region, including the strongest storm ever directly measured in the Western Hemisphere. Hurricane Patricia, which had winds that clocked in at 200 mph, hit the west coast of Mexico, though its effects were mostly confined to less populated areas. Parts of South America are also more directly affected by El Niño. The warmer ocean waters off its west coast tend to bring warmer weather to coastal areas during the Southern Hemisphere winter. Those waters also make more moisture available to storms. Combined with changes to storm tracks linked to atmospheric circulation changes, this can mean wetter winter weather for central Chile. Several rounds of storms during this event had some benefits, bringing moisture to a region in drought and snows to ski resorts. But the rains also brought flooding and mudslides. A rare storm event in March saw parts of the bone dry Atacama Desert receive a year’s worth of rain in just one day. The Copiapó River — dry for nearly 17 years — filled to overflowing and flash floods swept through several towns. Come spring, that influx of water led to a surreal bloom of flowers across the desert that tends to coincide with rainy El Niño years. The chain of changes to the Walker and Hadley circulations also tends to bring rainier weather to an area that includes Paraguay, northern Argentina, part of southern Brazil and Uruguay during the Southern Hemisphere summer. In December and January, heavy rains caused the worst flooding in the region in 50 years, displacing more than 200,000 people. The Paraguay River in Asunción reached more than 16 feet above its normal level in December. Thousands of acres of cropland were inundated and concerns were heightened for the spread of mosquito-borne disease like dengue fever and the Zika virus. In northern Brazil and other countries in the north of South America, the eastward shift of the Walker Circulation brings sinking air and drier conditions. Those come with the usual tendency toward drought, water shortages and crop and livestock losses. Drought and those follow-on impacts have been recorded in northeastern Brazil, an area already vulnerable due to poverty and remoteness. Some recent research has suggested that the exceptional heat and drought in the area may actually have helped fuel the rise of the Zika virus epidemic in the region. Heat promotes the growth of the mosquito that carries the disease, and during drought, residents tend to store water in containers in which the mosquitoes can breed. Further north, drier weather also tends to grip Central America and the Caribbean for the same reasons as northern South America. The area that spans Guatemala, Nicaragua, Honduras and El Salvador is experiencing one of its worst droughts in decades, according to the European Commission. Major crop losses have caused huge financial hits to farmers and left some 3.5 million people facing food shortages, the agency reported. Low water levels in Puerto Rico's Loíza Reservoir in June 2015. In the eastern Caribbean, 2015 was the driest year on record and led to water restrictions on many islands, including St. Lucia, St. Kitts, Barbados and Puerto Rico. Diminished water supplies also led to crop losses in the Dominican Republic, Haiti and other areas. As of August, Antigua had no surface water supplies, and by October it was using 100 percent desalinated water. The subsiding air that leads to drought also tends to help tamp down on hurricane formation in the region. This year saw a below-average Atlantic hurricane season. Not far away, though, El Niño brings the opposite conditions to Florida. The shifts in the Hadley Circulation affect the subtropical jet stream that crosses the U.S., pushing it southward and making it extend further eastward. This puts Florida in a prime location for storms during the winter months, which is normally its dry season. It also ups the odds for tornadoes thanks to the added energy from the jet stream. Florida did have a wetter than normal winter this year, and its southern tip had its wettest year on record. It also saw 18 tornadoes in January and February, compared to the seven it usually sees during those months. While tornado activity may typically rise in Florida in El Niño years, it is usually tamped down in the area of the central U.S. known as Tornado Alley. The more southward jet blocks the moisture from the Gulf of Mexico that is key to fueling spring storms there. An experimental seasonal tornado forecast favors a below-average tornado season there this year. The tweak to the jet stream also tends to favor wetter weather over Southern California — much needed this year after four years of deep drought. While storms have been hitting California, they have mostly affected the northern portions of the state because the jet stream has been slightly further north than is typical during an El Niño. The rains shut off almost completely in February, bringing hot and dry weather to the state, though storms have since returned and look to bring at least some rain to Southern California. Across the northern tier of the U.S., from the Northeast all the way up into eastern Alaska, El Niño tends to favor warmer than normal conditions. That has indeed been the case this year, with nearly all northern states recording one of their top 10 warmest winters. Alaska saw its second-warmest winter in the books, which has contributed to a lack of snow in varied locations there. That dearth of snow can have ecological impacts and promote the spread of invasive species. El Niño wasn’t the only reason Alaska was warm, though, as the Arctic more broadly was exceptionally warm this winter. And, finally, across the Atlantic in Africa, some of the populations most vulnerable to El Niño’s impacts are found. In the Southern Hemisphere summer, the eastward shift of the Walker Circulation leads to rising air over Kenya, southern Somalia and southern Ethiopia, which can enhance seasonal rains. Increased rains can lead to flooding, mudslides and outbreaks of diseases. The effects of El Niño-fueled rains in Kenya. Heavy rains in the area began in late October, inundating villages and agricultural lands. By January, more than 100,000 people had been displaced and 112 killed, according to the International Federation of Red Cross and Red Crescent Societies. 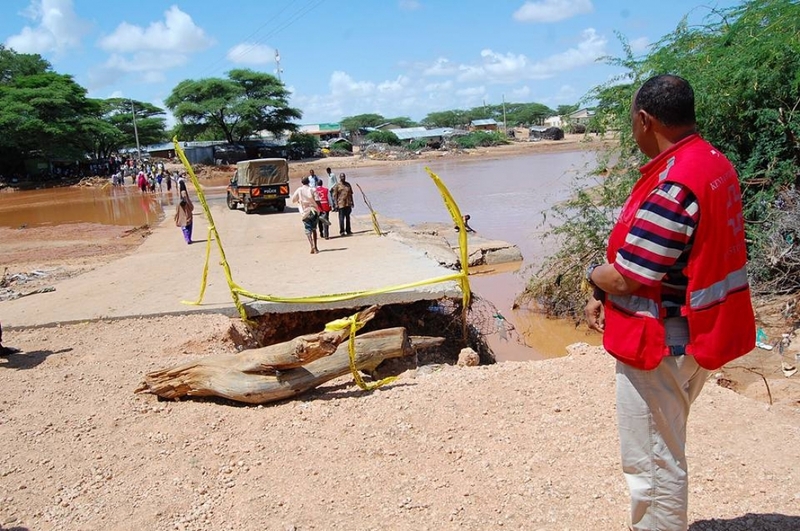 Authorities are concerned about the spread of both waterborne diseases, such as cholera, and mosquito-borne ones, particularly Rift Valley Fever, which tends to occur in years with unusually heavy rainfall. Just to the north, in Ethiopia and Somalia, El Niño has brought dry conditions that have exacerbated a drought and led to crop failures and widespread livestock deaths, according to the United Nations Food and Agriculture Organization. Drought has also gripped large parts of southern Africa, particularly the northeast of South Africa, Mozambique and Zimbabwe. The changes to the Walker and Hadley circulations interact with the normal monsoon there and tend to suppress monsoon rains, leading to drought, crop losses and food and water shortages. Severe rainfall deficits this year have lead to widespread drought that has decimated the maize crop, costing hundreds of millions of dollars in losses. Zimbabwe declared a state of disaster as some 2.5 million people are in need of food aid. South Africa, normally an exporter of corn, is expected to have to import it this year to feed its citizens. The drought has also severely reduced the flow of rivers that feed hydropower dams, leading to power rationing and even blackouts in the region. The flow down the majestic Victoria Falls has reached a 30-year low. While El Niño has shown signs in recent weeks that it is beginning to weaken, it will likely be late summer or early fall before it fully dissipates. Its weather affects around the world are expected to continue for several more months, and the impacts of that weather could reverberate for years to come, making it one for the record books.